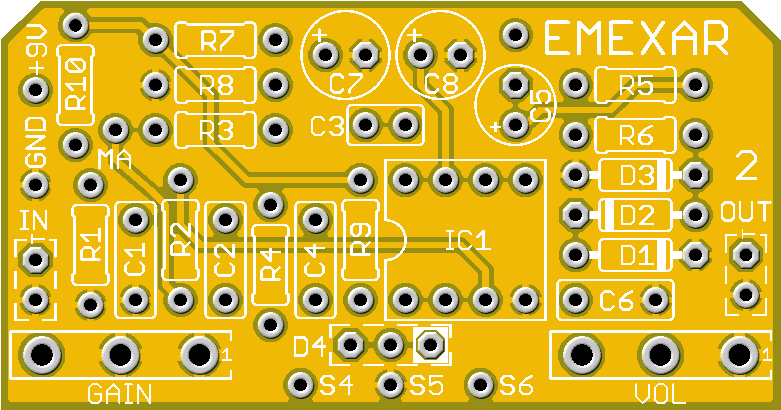 This kit includes all of the parts needed to build the GuitarPCB Emexar 2 project (250 Build). The components in this kit allow you to make a pedal that compares to the DOD® 250™, but also includes a few extra clipping diodes so you can customize the build to your taste. Please note that there are other Emexar kits available on our site that allow you to build a the Dist+ or M-Amp pedals, but this kit includes only the 250 components. This kit includes a 1590B enclosure and Davies 1510-style knobs. DOD® and 250™ are trademarks of Digitech®. Pedal Parts and Kits is not associated with and makes no claims to these trademarks. See our FAQ for more details. Check out this demo video by Barry at GuitarPCB! This demo shows how the overall tone of the circuit can be modified by changing one capacitor. This build has a switch and a DPDT mod board that allows changing between 2 different values for C4. This circuit tends to be a bit on the bright side, so adding some additional bass tones helps even things out a bit.